For years the Mountain Pine Beetle has been emblematic of the consequences of climate change for the western forests of North America. Forests from Colorado up through British Columbia have been ravaged by invading armies of pine beetles that thrive in the warmer and shorter winters at higher altitudes. 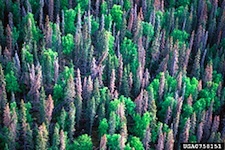 One third of the forests in British Columbia have fallen to the pine beetle. And jobs have been decimated along with the forests. The province has lost 20,000 forestry-related jobs since the mid-nineties. When the infestation progressed to west-central Alberta, the same fate was expected for Alberta’s forests. But progressive action based on the hard lessons of British Columbia and a run on weather-related luck appears to have allowed Alberta to, at least for now, dodge a bullet – based on a low-tach $250 million beetle infestation management plan. The trend toward warmer winters in the mountain forests, combined with human fire suppression, has upset the balance of the pine beetle and the forest cycle of old tress yielding to younger trees. More standing older trees attract pine beetles, many more surviving the winter and emerging from fallen trees in summer to feed off standing, still-healthy trees. One dead tree will take with it and average of ten surrounding trees. The key to Alberta’s plan is to identify newly infected trees and immediately remove them before they can spread the infection. During winters months, small crews with chain saws are dispatched to sites known as high infestation areas to quickly remove and burn infected trees. Fighting the battle one tree at a time. The numbers tell the story. Three winters ago, crews flagged 31,000 infected trees. This winter workers have only flagged 180 trees. Simple and effective, the diligence of a simply-engineered plan is paying off for now.